In the past, studies have shown a lack of success in Enterprise Resource Planning (ERP) implementations. But those statistics may be out of date, according to a survey conducted by Mint Jutras and published by Ultra Consultants. 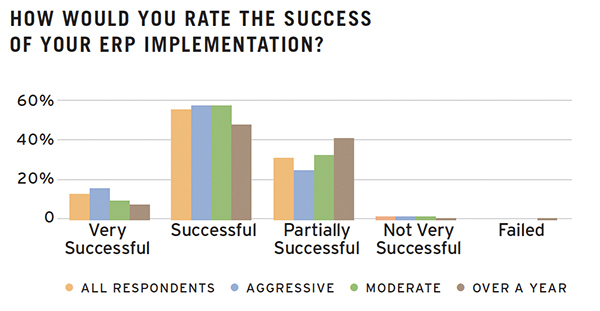 Sixty-seven percent of manufacturers and distributors responding to the survey rate their ERP implementations as successful or very successful (see chart). The primary reasons for success have to do with people and process, with factors including top management support and change management. Lack of implementation success could be due to factors such as inadequate business process re-engineering and lack of effective project planning. While many ERP implementations meet schedule, budget, and ROI expectations, the study shows a significant number of manufacturing and distribution companies overrate their success and leave additional attainable returns on the table.